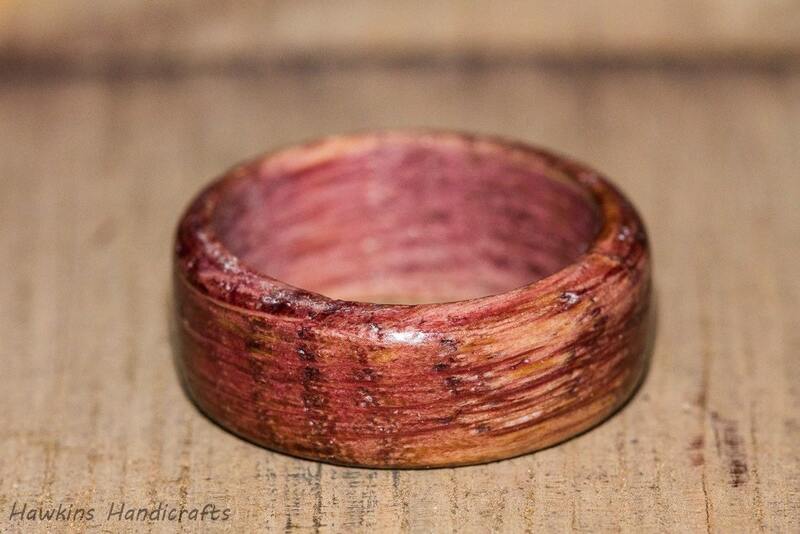 A unique solid wood ring for the wine drinker in your life! 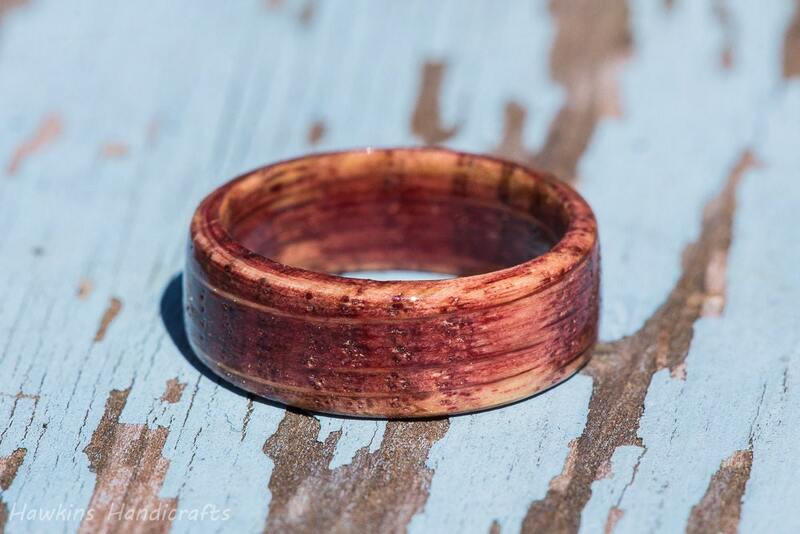 This is a hand-turned oak wood ring cut from used red wine sourced from Napa Valley and stained with the wine they once held, custom made to your specifications - choose the size, width, and shape from the options to create your own handmade ring! 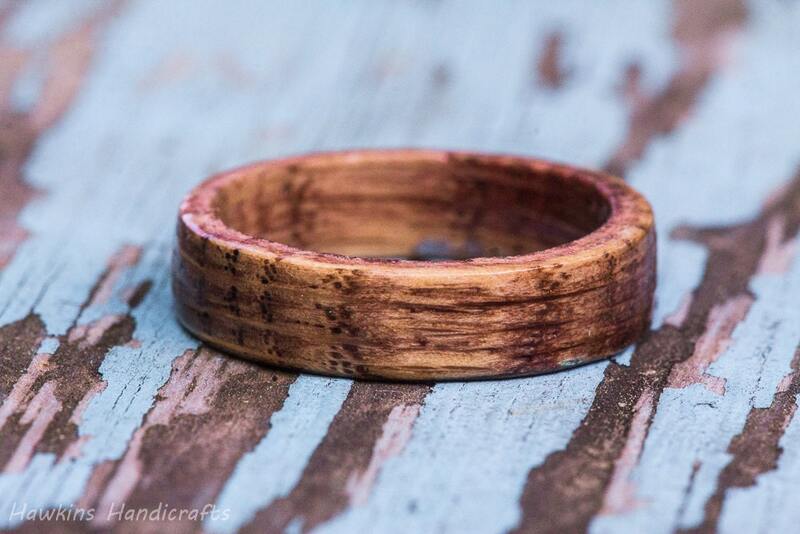 Your ring will have a similar look to those in the pictures - wine stained oak wood - but each ring is a unique piece of wood with it's own unique patterning with no two exactly alike! Please note the variability in coloring in the photos - due to variability in the time the wine was stored and the area of the barrel used, the purple may vary in intensity! Red wine barrels are often discarded by the vineyard after a single use since the tannins and oils in the wood have been drawn out during the aging process. These barrels are then sold off for a number of purposes, including use by woodworkers. 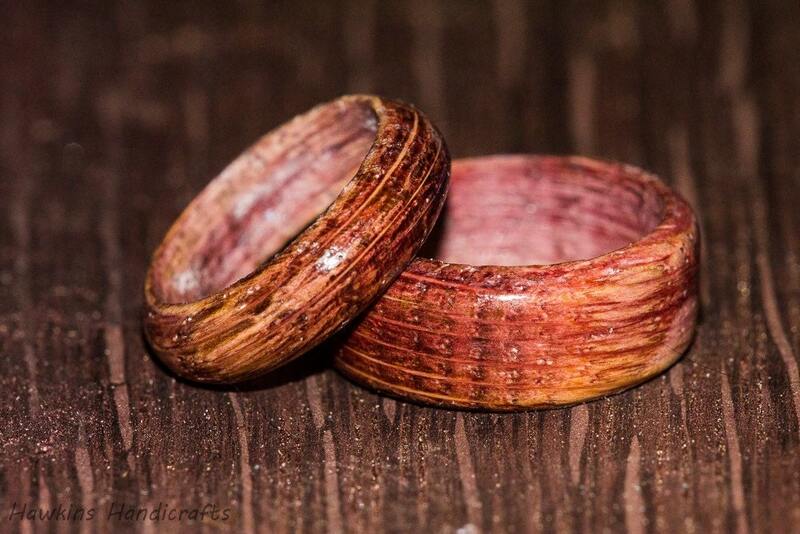 The barrel used for these rings is obtained from a vineyard in California's famous Napa Valley. The barrel staves are cut and drilled, revealing the beautiful grain of the wood which has been stained varying shades of purple from years of contact with the wine - and leaving the shop with a distinct red wine smell in the process! I bought this for my fiancé who loves nature, wine, and encourages creativity. Needless to say it was a MAJOR hit!! He absolutely loves it, and loves the work, care, and creativity that went into the ring. Thank you so much! Will definitely be letting everyone know where we got such a cool find! Let me start off by saying Daniel has been helpful since start to finish. I have been super excited to receive this ring for my significant other and it is just what I wanted, it's a gorgeous ring. I was a little disappointed with the engraving that was done because it is hard to see but Daniel explained to me that is why he doesn't engrave dark woods and he had already promised it to me, (completely understandable) he also gave a partial refund for it since it's not what I had pictured. 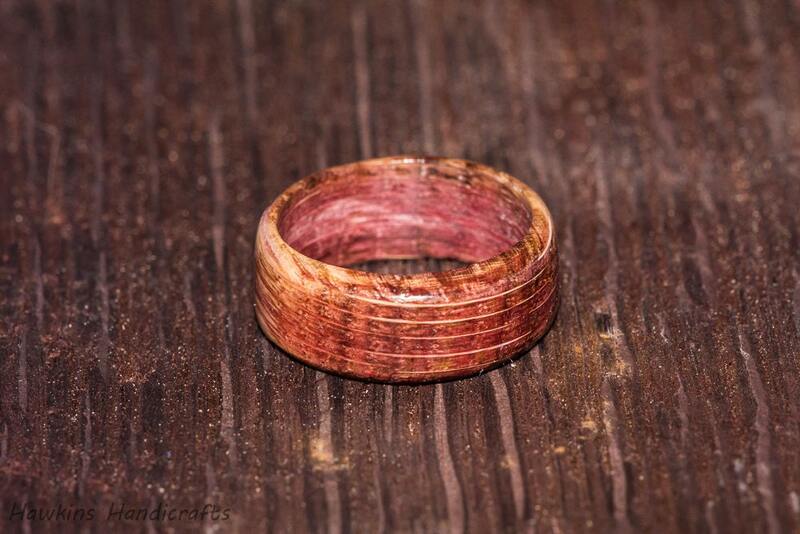 I appreciate the thoughtfulness and kindness of this owner and his willingness to make this the perfect ring for me. I would highly recommend! A beautiful ring, fits perfect! Can't wait to wear it!